The first wine where the mineral characters really shout to be heard. There are herbs too and dark plum fruit. It’s fresh and weighty in the mouth; a port of real authority. Single bottle 75cl. Price Includes UK DUTY & VAT. The Symington family is pleased to announce the release of a 2015 Vintage Port from Quinta da Senhora da Ribeira, a vineyard to which they have a strong attachment. The current generation’s great grandfather, Andrew James Symington, took ownership of the Quinta in 1912 when he became a shareholder in Dow's, which had originally acquired the property in 1890. 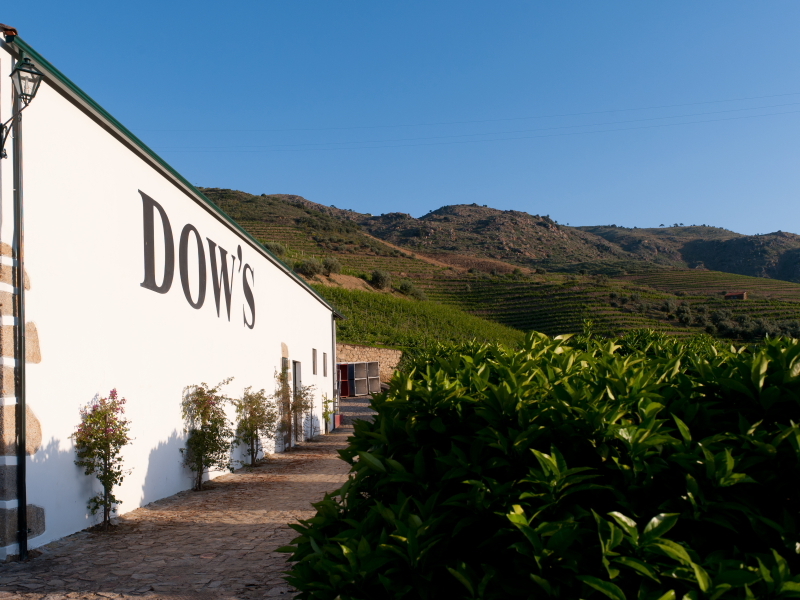 Together with Quinta do Bonfim it has been the mainstay of Dow's Vintage Ports for 125 years. 1 Bottle (1 x 300cl). Quinta da Senhora da Ribeira is set in the remote, hot and dry Douro Superior and commands a magnificent north bank position. Senhora da Ribeira’s wines are some of the finest in the Douro and they complement those from Bomfim in the composition of Dow’s classic Vintage Ports. The quinta’s high proportion of old vines (45% are over 25 years old) is of critical importance. The old vines are very low-yielding, producing on average less than 1Kg of grapes each, giving intense and concentrated musts which are ideal for classic Vintage Port. Quinta da Senhora da Ribeira is set in the remote, hot and dry Douro Superior and commands a magnificent north bank position, overlooking a broad sweep of the Douro. Senhora da Ribeira’s wines are some of the finest in the Douro and they complement those from Bomfim in the composition of Dow’s classic Vintage Ports. The latter would be incomplete if one of the two was absent. Exceptionally aromatic, with aromas of violets, which is quite typical of the Vintage Port from Dow's. In the nose blackberry ringtones, black currant and plum. There is also present notes of esteva contribution of the Touriga Nacional. This is a vibrating wine, which shows already quite complex and subtle. Has something of spices, from the relatively high proportion of Sousão, which are balanced by fresh acidity and minerality. On the palate its dry but firm with a long finish and ripe tannins. "Deep garnet colour. The nose is just beginning to evolve into musky, dried plum and raisin aromas with whiffs of tree bark, nutmeg, cumin and cloves. The palate is seriously big and voluptuous with medium to high acidity and a medium to firm level of fine tannins. Very long finish." In Asia. An outstanding port scoring 90 points on the Parker rating. "This is an extraordinary house that seems to have been particularly successful with its vintage port since 1977.The 1983 is rich, concentrated, very fruity, and magnificently perfumed, suggesting that it is going to mature early, long before the 1977. Parker 1989, Wine Buyers Guide. Vintage Port MAGNUM bottle (Comes in individual case as illustrated). Very dark red/black center, dark red to brown rim. Creamy, blackberries and black cherries, slightly herbal notes (good), smoke and wet stone, sweet. Very complex, maturity, red currants and black cherries, herbs and smoked meats, in the middle acidity and tannin (still! ), great length - 60 seconds plus of blackberries and plums. This is an extraordinary Dow. Please note that this is a rare magnum format (1.5 L) presented in a Dows presentation case. A rare Dow Tappit Hen format for this vintage Port. This is ex-cellars Oporto where it has been stored since bottling. Very limited Edition - Only 200 Bottles have been released. ranked amongst the first growth producers of Vintage Port, Dow's reputations was constructed over two hundred years and rests on the excellence of the company's Upper Douro Valley vineyards. The Dow's 1975 Tappit Hens have been aged in perfect conditions in the Symington family's own private cellars and now after four decades of ageing are refined, elegant and drinking wonderfully. This is a rare library release of a Dow rare Magnum format from the Symington cellars in Oporto. This is an extraordinary house that seems to have been particularly successful with its vintage port since 1977. The 1975 is good, fully mature, fruity and soft. Robert Parker, Buyers Guide 1989. A rare bottle of Dow 1972 from the good 1972 vintage. "This is an extraordinary house that seems to have been particularly successful with its vintage port since 1977. The 1966 is a top success for that vintage; in fact, it would be hard to find a better port from that year." Robert Parker, Wine Buyer Guide. The 1965 Dow is a rare wine. Generations of Symington winemakers have worked at the Dow's vineyards: Quinta do Bomfim and Quinta da Senhora da Ribeira, creating from them Dow's superbly concentrated wines that are intense and tannic when young, maturing towards a superlative racy elegance with age and scented with violet and mint aromas. Dow's attractive and distinctive drier finish is the recognisable hallmark of the wines from this great Port house.